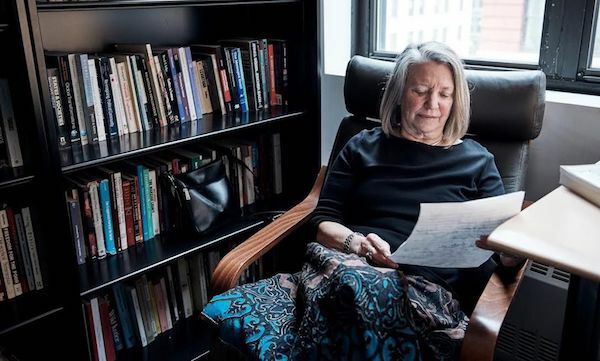 Bringing together scholars from across fields, Chiara Bottici and Banu Bargu have set out to curate a vital collection of reflections on the trajectory of Nancy Fraser’s thought across a career spanning nearly four decades. This piece was first published on The New School's Research Matters blog. To celebrate the occasion of [New School] Politics Professor Nancy Fraser’s 70th Birthday, Chiara Bottici and Banu Bargu — respectively, Associate Professors in the departments of Philosophy and Politics at The New School for Social Research — collaborated to edit Feminism, Capitalism, and Critique (Palgrave Macmillan). Bringing together scholars from across fields, Bottici and Bargu set out to curate a vital collection of reflections on the trajectory of Fraser’s thought across a career spanning nearly four decades. The result is a collection of fifteen essays that brings together some of the most prominent names in critical theory. Among them are thinkers who share both a personal as well as a scholarly affinity to Fraser’s work, having been her major intellectual interlocutors. Beyond its personal value, the text offers a full course of philosophical reflection on the key themes governing Fraser’s scholarship — themes that continue to be as relevant as ever today. This string of ambitions could serve as a mission statement for Fraser’s scholarship itself, which has evolved considerably over time. “If you look at her entire body of work, you can see an expansion of the question of feminism in its connection to capitalism, into all other spheres,” said Bottici. She explained that Fraser began as a Marxist feminist, but “broadened the scope of her analysis in order to include redistribution, participation, recognition, and — more recently — race and ecology.” Fraser’s ability to expand the scope of her work has become one source of her enduring influence, and one way to explain her capacity to have inspired multiple generations of feminists. “For us, feminism was never an identity politics,” Bargu said, “[rather] it is the anti-capitalist component of Nancy’s feminism,” that most closely links her and Bottici to Fraser. Anti-capitalism stands as one of the most crucial of Fraser’s positions. Her commitment to developing an accurate and complex account of the relationship between gender oppression and capitalism has taken on new relevance in the current moment, as progressives search for a way to advance many causes with one voice. Without this emphasis, feminism can be co-opted, and women’s empowerment can (and frequently does) come to signify merely fighting for women’s freedom to exploit others. In the view of mainstream neoliberal feminism, empowering women might mean — for example — placing more women on corporate executive and directing boards, electing women into political office, or otherwise vesting women with power or authority over others within existing corporate or state structures. For Fraser and the editors, these outcomes should not be the focus of feminism. Or as Bottici characterized Fraser’s position, “feminism does not mean women capitalists.” She added that for her and Bargu, at least, “it also doesn’t mean women presidents, either. This is a very crucial point, even more so in a time when figures like Ivanka Trump write books to empower women, with the very telling title Women who Work.” The work of feminism in their view is not to broker access for women to the top of the hierarchy, as this most often this implies exploiting other, less privileged women, but to dismantle those structures. Along the arc of her career — as the contributions from this collection attest — Fraser has attempted to map the middle ground between reductive "economistic" Marxist models with their chief alternatives, found in "culturalist" models of feminism, which focus on identity and discourse subversion. There is a tendency, Bargu and Bottici argue, to paint socialist feminism as a kind of white or Eurocentric phenomenon, a branch of feminism that focuses exclusively on the specific kinds of oppression and destitution visited upon cis white women to the exclusion of women of color, queer women, and trans women. Fraser’s work presents a socialist feminism that is allied with and attentive to these struggles, placing them front and center. Especially in Fraser’s recent work, all left-wing feminisms must ally against the hegemony of liberal feminism. Fraser’s feminism represents an abiding concern with justice and a deepening of our understanding of what justice might truly look like. Her work moves us from recognition to redistribution, and from economism to new social movements. Fraser has been a constant presence within feminist politics and philosophy, attempting to take the best from different approaches without blunting their critical edge. As Bargu put it, “justice is a way to critique the present, but also a way to critique the alternatives to the present.” Fraser’s critiques have been aimed not just at systems of oppression, but also as a response to the failures of the left to comprehend properly and to respond to these systems. Feminism, Capitalism, and Critique is out from Palgrave McMillan this summer. Lucas Ballestín is a PhD student in philosophy at The New School for Social Research, where's he's working on a dissertation about psychoanalytic theories of ideology.